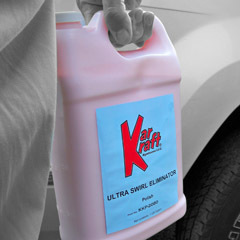 Ultra Swirl Eliminator provides a long lasting shine while eliminating swirls from compounding and polishing. It is also great for removing minor imperfections for new car preparation. It can be used by hand or machine to remove micro-scratches, swirls and light oxidation. Ultra Swirl Eliminator produces that deep ‘wet-look” shine that professionals demand.